Various illness ailed ancient peoples, although plagues or large-scale epidemics spared the Chinese and western European world until the second century. To treat deceases and wounds, both world resorted to surgery, although the Chinese tended to emphasize more on herbs and less invasive methods. Without anesthesia, both peoples upheld the ideal of enduring surgery with stolid calm. 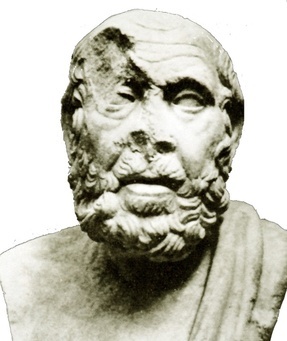 A Roman copy of a Greek statue of Hippocrates of Cos (about 460—377 BCE). Practitioner, teacher, and writer, his influence on western medicine is widely honored. (Museo Della ViaOstiense, Rome). 2. The sagacious herb taster. 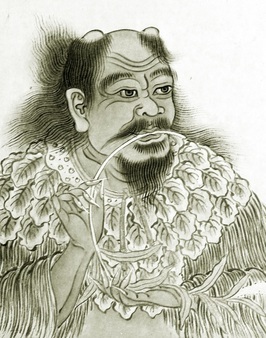 The mythical sage Shennong (the Divine Farmer) was reputed to have invented Chinese medicine by tasting diverse herbs to identify hundreds with medicinal effects. (Welcome Trustees, London). 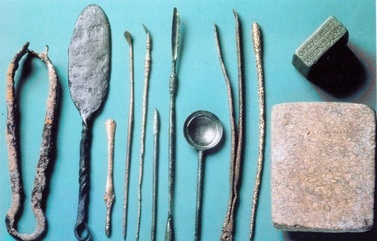 A wide collection of surgical instruments were recovered from Pompeii. 4. 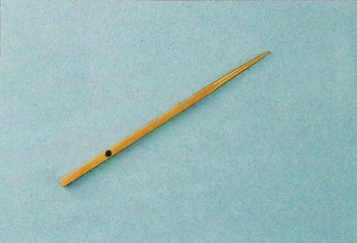 A Han acupuncture needle. A golden acupuncture needle recovered from a Former Han tomb. 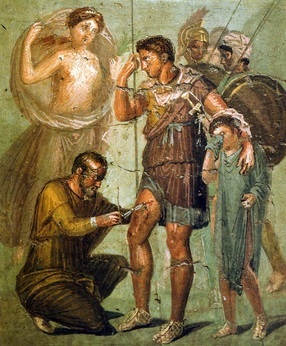 Aeneas, the mythical founder of Rome said to have escaped from Troy bearing his father, is treated by a surgeon for his leg wounds. (Mural from Pompeii, Archeological Museum, Naples). 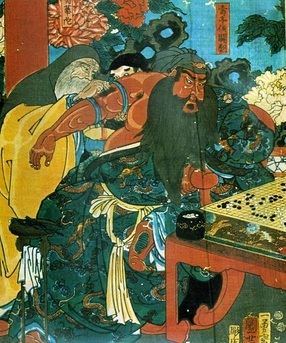 The end-of-Han general Guan Yu, wounded by a poisoned arrow, is treated by Hua Tuo, who removes the affected flesh and scraps the bone while Guan concentrates on a game of go. (Woodblock print, National Library of Medicine, Bethesda). 7. A Roman legionary hospital. Model of the legionary hospital at Vetera. (RheinischeLandesmuseum. Bonn). 8. 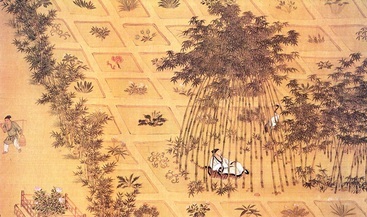 A Chinese medicinal herb garden. Idealization of a garden for medicinal herbs. (Ming painting). The creativity of the Roman Empire and Han China declined compared to that of pre-imperial times, but was still formidable. Hero of Alexandria was a prolific inventor, among whose works was a steam engine. ZhangHeng of the Latter Han invented a seismograph in 132. A schema of Hero’s steam engine. 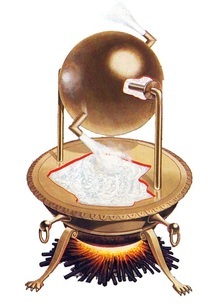 A rotatable hollow ball is suspended by two pipes, which let in the steam generated by boiling water in an enclosed container. The high-pressure steam escaping from opposite outlets set the ball rotating, the work of which can be harnessed. A model for Zhang Heng’s seismograph. 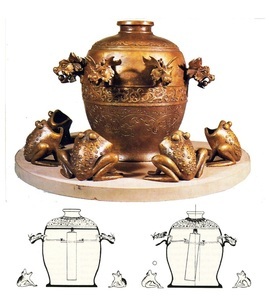 The bronze jar has eight dragons facing eight directions, each holding a ball in its mouth. Inside the jar is a pendulum constrained to swing in eight channels. Shock waves from of a distant earthquake set the pendulum swinging along their direction of propagation, which causes the dragon facing the epicenter to open its mouth and drop the ball into the mouth of the frog below. 11. 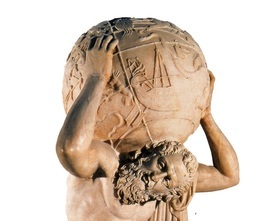 Atlas bearing the globe. Atlas bearing the globe, on which are depicted the constellations. 12. An ancient Chinese starchart. 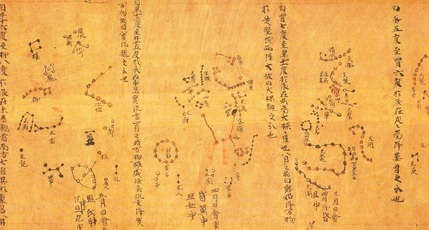 A Chinese star chart circa 940, recovered inDunhuang (British Library, London).